*This post is part of the Hit Me With Your Best Shot series by Nathaniel at The Film Experience, and contains spoilers regarding the plot of David Cronenberg’s Dead Ringers. 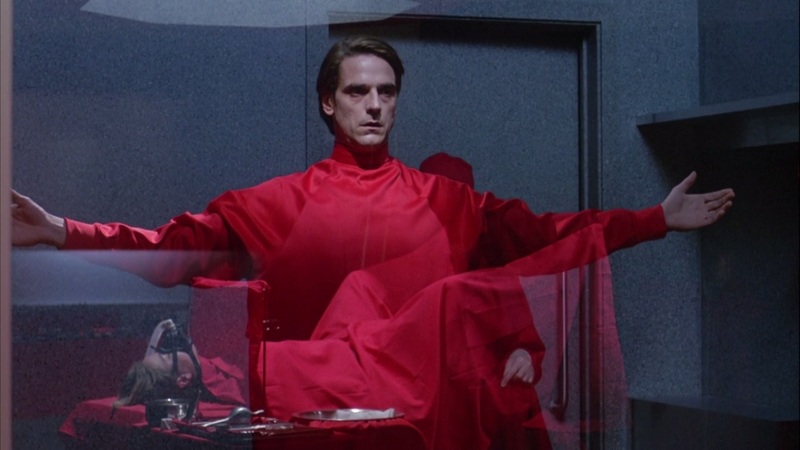 One of the things that has always struck me upon repeated screenings of Dead Ringers – my favorite David Cronenberg film, which isn’t saying as much as you’d think, since I generally don’t obsess over the Canadian auteur’s work like most other cinephiles – is how much mileage it gets out of its seemingly innocuous moments in creating suspense. The horror is in the moments that portend something horrific happening, or that imply a horrific thing has already happened, rather than showing us what actually happens. This structure owes much to the perfectly cast Jeremy Irons, whose icy visage withholds emotions from the audience despite two superb, layered performances as the twin gynecologists. Irons opens himself up, breaks himself apart, moulds it all back together, and yet, there’s always a certain distance. He is the core of the film’s eerie atmosphere at all times by remaining impenetrable and emotionally unpredictable, as if no amount of crying with a broken heart can convince us that he’s human until we see him bleed. And even then, one wonders whether he has become any more accessible or is really just a mutant man being operated on by instruments for mutant women. This bleeding is central to my favorite shot of the film, but before I get to that, I shall take a moment to highlight the most iconic shot in Dead Ringers – the shot above – which is truly a stroke of compositional genius. In this scene, Beverly, one of the two doctors, is about to perform surgery on a patient. The procedure almost marks his last medical practice and his ominous pose and the crimson splash certainly foreshadow a gory end to his story; but what Cronenberg does here is to take body horror and turn it on its head. Bodies are the source of our uneasiness but it is not their presence, not their physical limits, but their absence and their nebulous outlines caused by intertwined superimposition.We are not scared because harm is being done to the bodies; we are scared precisely because these bodies seems to float in the ether beyond the limits of their skin, beyond our understanding of them. My favorite shot of the film also has the same poignancy in the way it induces fear in the audience. In this case, Cronenberg has built suspense up to this moment, effectively making it clear that the life of at least one of the brothers will end here or that something much more grotesque than death is at store, given the presence of the monstrous, self-designed medical instruments in the vicinity. Yet, when the critical moment arrives, what we see is a shot of Elliot’s arm resting calmly on the patient’s couch. All the density of the moment is then depleted through a stream of blood that starts to run from under Elliot’s body, indicating that whatever grandiose display of surgical brutality we had braced ourselves for has come and gone with a fizz, not a bang. Few films have captured violence with as much elegance as Dead Ringers does and these final moments of Elliot’s life encapsulate the formal restraint with which Cronenberg achieves such poise. I love what you said about both of these shots, and that rivulet of blood is a total standout for me, too. 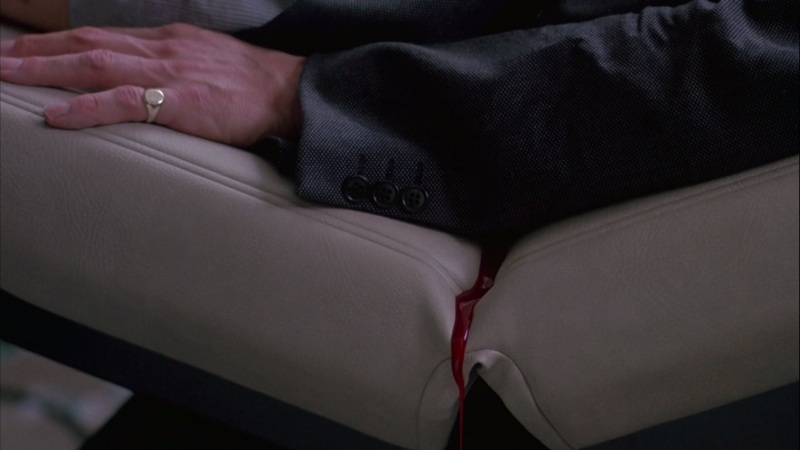 I admire even the way that the shot takes something totally mundane – the uncomfortable creases in a plasticized chair or seat cushion, in a car or a doctor's office – and makes it the vehicle for something totally uncanny. “Elegant violence” indeed! Thank you so much gentlemen. Glad to know you feel the same about these shots.